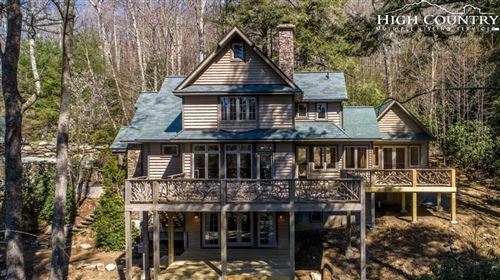 Beautiful Custom Timber Frame home located in the gated community at Headwaters of Banner Elk. As you enter the home, the roomy foyer leads you into a large living room with an enormous gas fireplace. You will find a hand carved mantel above the fireplace and Tiger Walnut floors throughout. With an open concept, the living and dining rooms flow into the kitchen area. With all stainless steel appliances and beautiful granite countertops, this kitchen is equipped for entertaining family and guests. The master bedroom is on the main level as well as the laundry. The master bedroom is spacious and very light and bright with a cedar walk-in closet and a large en-suite. The second level offers an open and airy loft space. There are also two bedrooms and a full bath. The detached garage offers an apartment suite with a full bath, a kitchenette and hardwood floors. End the day with s'mores by the fire pit! Headwaters is just minutes from downtown Banner Elk and has wonderful amenities to keep guests entertained.